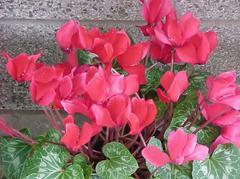 During the Christmas season, cyclamens are a popular gift, possibly because they are associated with the Holy Land. The beautiful cyclamen (Cyclamen persicum) is often called Solomon’s crown. Although not identified in the Bible, cyclamen grow freely among rocks and on rock walls in Israel. It is native to the eastern Mediterranean region. Generally, cyclamen grow from corms (small bulbs), but with enough patience, they can be grown from seeds. In the United States, cyclamen are winter hardy in zones 9–11. Recently, florists have developed smaller cyclamen (2-4 inch tall blossoms) that are hardy in zones 5-8. Last fall, I purchased and planted three of the hardy cyclamen corms in St. John Church Bible Garden. I am hoping that they will grow in the spring. Reflection: The more I read about Solomon, the worse I feel about him. He had so much going for him; however, he succumbed to worship of his wifes’ gods. We need to be sure that we never slowly drift (like Solomon) to worship of a god other than God. This entry was posted in Uncategorized and tagged Bible Plant, Bible Study, Cyclamem periscum, cyclamen, God as a Gardener, Rooted in God, Solomon's crown. Bookmark the permalink. God is our only strength. We must always remain in him and focused on his promises. But, guard against the devil on our journey. I agree with you Carolyn, seems like everything today is geared to pulling us away from God! Stay strong everyone’s!